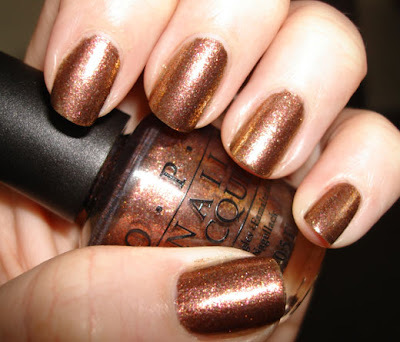 For Thanksgiving weekend, I painted my nails with OPI's Warm and Fozzie from the 2011 Holiday Collection (The Muppets). I absolutely love bronze nail polishes and was excited to try this one out. There is a world of difference between the first and second coats of this polish. I used 3 to achieve full opacity. It wore for about a week without really chipping and I was happy with the results (lots of compliments on this one). I was hoping it would have more dimension (in a lot of the swatch pictures I saw online, it almost appeared to have an ombre effect) but it's still a beautiful shade for fall. 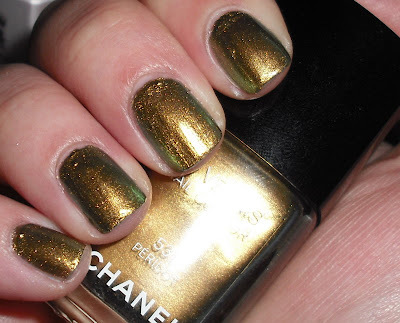 Today, I finally used my new Chanel polish in Peridot. I told myself I would never splurge on a Chanel polish unless I found an extremely unique color that didn't have a dupe from a cheaper brand. I only bought this because it wouldn't likely be matched by an alternative polish. Peridot is a unique green/gold shade. I thought it would be a nice transitional color to wear from fall into the holiday season. Let's just say that I love to look at it in the bottle but on my nails and against my very cool, fair skin, it leaves a bit to be desired. The application is tricky. It definitely shows brush strokes and every mistake (pretty standard for Chanel). On the plus side, one coat will work fine which is convenient but I did two in hopes that the color would become a bit darker- it didn't. This is certainly not a buildable polish. In some lighting, it appears like a yellowed gold and in others it switches to a greened/gold with the ever so slightest touch of blue. It's definitely not a pedicure color (I feel it would look like a toe fungus). As much as I want to lovvvve this, the color/effect seems a bit dated to me (80s/90s). But it is original and for that, it earns many points. I will try this again in the spring with whites/creams/neutral clothing (I think it might look nice this way) but I wouldn't repurchase.